Tens of thousands of anti-Brexit protesters have marched in London to demand a new referendum on leaving the European Union, as a divided Britain marked the second anniversary of its vote to quit the bloc. 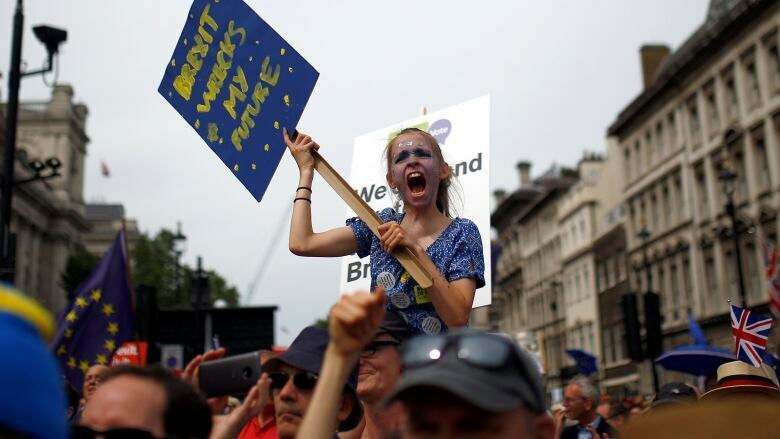 Tens of thousands of anti-Brexit protesters marched Saturday in London to demand a new referendum on leaving the European Union, as a divided Britain marked the second anniversary of its vote to quit the bloc. Britain voted 52 per cent to 48 per cent on June 23, 2016, to quit the EU, and its official exit is slated for March 29, 2019. But the country — and its Conservative government — remain divided about what kind of economic relationship it wants with the EU. The crowd numbered in the tens of thousands, with organizers estimating 100,000 people took part. Police did not give an official estimate. 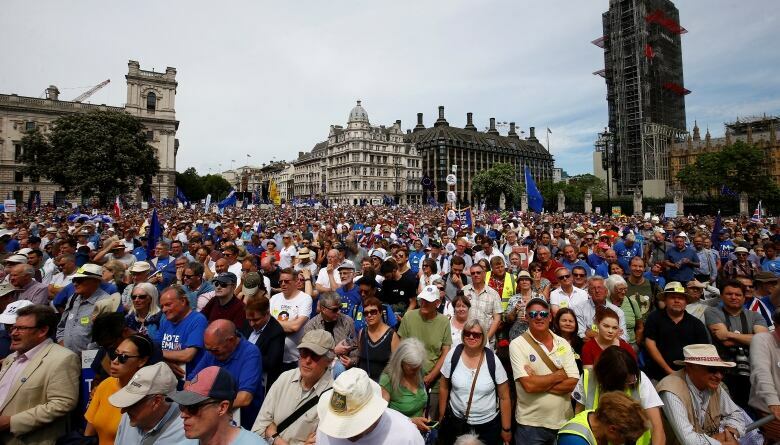 A rival pro-Brexit march, demanding that Britain not compromise with the EU, drew a far smaller crowd. "The most important thing is that this isn't decided just by 650 politicians in Westminster. Brexit is such a big deal it should include all 65 million of us in the country." Amid the uncertainty, EU leaders are growing frustrated with what they see as a lack of firm proposals from the United Kingdom about future relations. A paper setting out the U.K. government position on future relations, due to be published this month, has been delayed until July because the cabinet cannot agree on a united stance. Katherine Bennett, the company's senior vice-president in the U.K., said "a no-deal Brexit would be catastrophic."